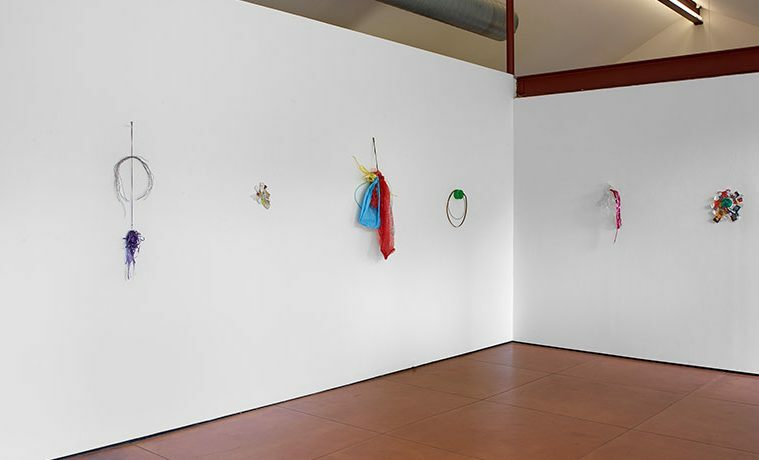 Tony Feher: Super Special Happy Group, Installation View. 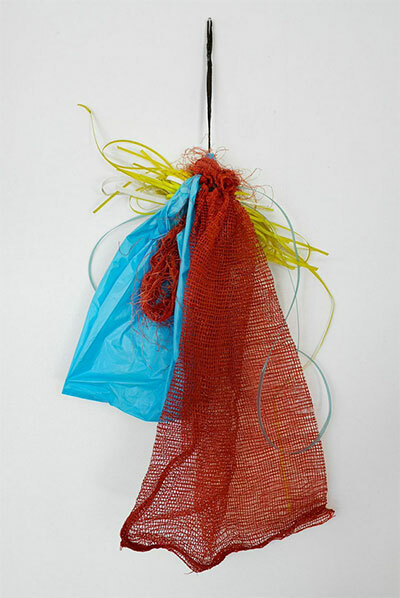 Tony Feher, Preliminary Aspect, 2001 Red onion bag with black draw string, blue plastic tee shirt bag and blue, white, and yellow plastic strapping 36 x 26 1/2 x 4 Courtesy Hiram Butler Gallery. For better or worse, American sculptor Tony Feher creates art from trash or, in art-world speak, he uses “everyday objects and found materials in a post-minimalist aesthetic.” But for Super Special Happy Group, his current exhibition at Hiram Butler Gallery in Houston, there is no question: The show is comprised of trash pinned to the wall. Entering the gallery, I feared being wooed by Feher’s reputation and popularity. On the other hand, I was suspicious of his prestigious museum acquisition track record, and I anticipated (maybe even hoped) to fervently dislike the exhibition, expecting to find numerous reasons why the work and the artist were a joke or, at the very least, just plain bad. Feher himself has been videotaped as saying that he may be a bad artist but he is still an artist; further, he insists that the words necessary to talk and write about his work have yet to be invented. I disagree. I challenged myself to genuinely consider the work, instead of immediately dismissing it, zeroing in on select pieces that, for whatever questionable reasons, caught my attention. The materials are mostly identifiable or at least familiar—Band-Aids, cellophane, twisty ties, gum and candy wrappers, ticket stubs, cigarette boxes —layered and stapled together with many areas covered in dirt and grime. On the formal side, it is evident that Feher thoughtfully composes each piece; they are certainly not slap-dash. There is a sense of visual balance in both color and weight, and the pieces are not without their charms. He capitalizes on, and seems driven by, the fact that we are always in search of meaning, especially when it comes to looking at art—or what is presented to us as art. And so what happened for me is not surprising, similar to seeing cartoon characters and animals while cloud watching: I saw the shape of Texas in Super Special Happy Group #7. Castaway brings to mind the Dreamcatchers of Feher’s New Mexico birthplace, and Mary Jane’s American Spirit Tootsie Roll Recording Device is a prize ribbon, corsage, or a nod toward a Texas mum. The exhibition is small in scale—nine pieces in all—which is a disservice to the work. Spatial consideration is a necessity for fully considering Feher’s work which suffers here because of the conventional, if not rigid, display of the works on the wall. The pieces need room, or rooms, as they had in his retrospective at the Blaffer Art Museum in 2012 or his performative installation Free Fall at Diverseworks in 2013. In Super Special Happy Group, there is nowhere to go with the work, mentally or physically. And once you see the price tag—pieces of trash stapled together are listed as high as $18,000—your sprits, like mine, might just drop down into the gutter. One upside is that the exhibition, and Feher’s work in general, creates a situation in which to consider value in things that would otherwise be discarded or overlooked, to see the power of intentionality, re-use, and display. Perhaps he is taking us for a (very expensive) ride, but what is the harm in learning to recognize and appreciate beauty in the things around us—even trash? What else might we begin to consider as valuable? 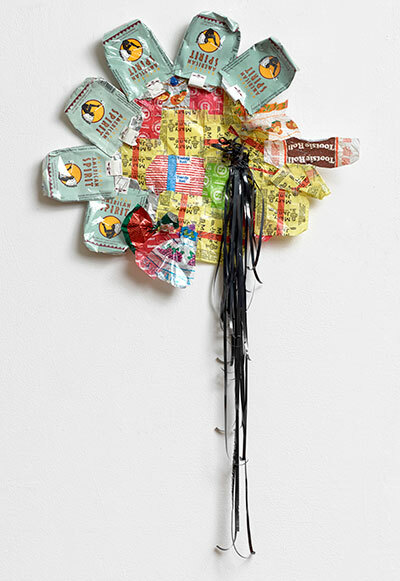 I hesitate to give Feher too much credit for any “aha!” moments respective to humanity’s position on value or consumerism (he has made it known that his use of trash is not about re-use, recycling, or the like) or to recognize his work along a lineage of art historical movements. Artists should (yes, should) be masters of material, to draw out or infuse those materials with meaning—a practice that demands more than arranging objects in visually pleasing ways. I left the gallery wondering if I just wasted my time considering waste as art. Bottom line is, I’m not buying it.